KIGALI, Nov 30 2018 (IPS) - Over 1000 policy makers, experts, investors and financial specialists from across Africa are gathered this week in Kigali, at a week-long Africa Green Growth Forum 2018 to discuss how to foster green, made-in-Africa innovations to meet the needs of the continent. 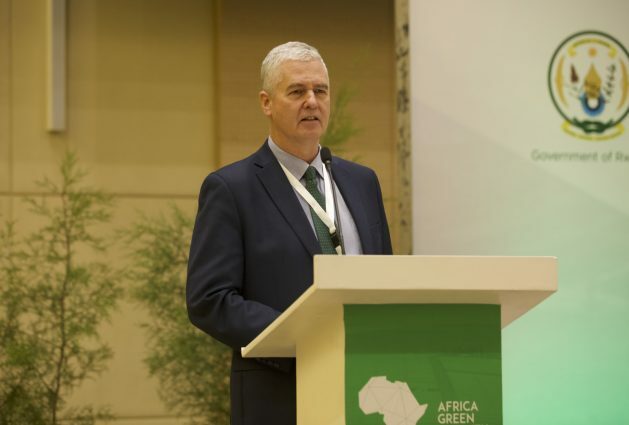 There is no doubt that green growth is a number one priority for governments but many are mistaken if they believe green growth is more costly, Frank Rijsberman Director-General, Global Green Growth Institute (GGGI) told delegates at the high level policy dialogue session. Rwanda’s new Bugesera airport, will be the first-ever green airport in Africa, and the government’s biggest-ever project. It will have rain water harvesting and cut water use by 50 percent, and will have enough solar panels to make it zero carbon emission facility said Rijsberman. “Did the airport become expensive by adopting these changes? No. It became cheaper by five million US dollars,” he said. The over 800 million dollar project is being funded through a public private partnership, and is one of many green projects the GGGI is working on with the government of Rwanda. GGGI is also supporting the implementation of the government’s plan for green development of six secondary cities as well as eco-friendly tourism by introducing electric motorbikes or e-motorbikes. The e-motorbikes will be cheaper than petrol-powered ones demonstrating that green products do not have to be expensive said Josh Whale, the Chief Executive Officer of Ampersand, a company that is building electric vehicles and charging stations in East Africa. Supported by GGGI, it has introduced e-motorbikes into Rwanda and has plans for other electric vehicles. “Assembling all the e-motorcycles in Rwanda will certainly result in several thousand new jobs and will also green existing jobs. So motorcycle and taxis mechanics will become green jobs,” said Whale. The Forum is showcasing a number of other green-friendly initiatives that promote environmentally sustainable and socially inclusive economic growth. There are many opportunities for green entrepreneurship and private investment in transport, infrastructure and agriculture in Africa, said Rijsberman. “Involving the private sector more, helping to drive innovation, helping to drive entrepreneurship, creating green jobs has to be a growing part of government green growth strategies,” he says. During different panels and sessions there were comments about a large gap in youth interests in the environment and green technology and the difficulty accessing funding for innovations that could bring affordable green technologies to Africa. Rodriques also called for investment in innovative green projects and for stakeholders to improve their understanding and use of finance as a tool for climate resilience. A common issue is quality projects in need of financing while financial institutions say they have the money for quality projects but can’t find them said Pablo Vieira, Global Director at NDC Partnership. This is a coalition of countries and institutions dedicated to strengthening collaboration among nations to help implement countries’ Nationally Determined Contributions (NDCs) to reduce carbon emissions under the Paris Agreement. “We work in 36 countries right now with governments saying they have many projects ready for financing but find it hard to get finance,” said Vieira. Meanwhile financial institutions are looking to finance quality projects. Acknowledging that governments afford to support all projects, Vieira calls for a new system to help entrepreneurs build quality projects. He also appealed to financial institutions to change their “business as usual” approach for the way environmental funds are delivered. The forum started on Monday 26 November and is set to close on Friday November 30.